Cyclone Center is tracking two storms as we classify this afternoon. A Quiet Hurricane Season in the Atlantic? We wanted to post a cyclone-related, fun, festive blog entry for the 2013 Zooniverse Advent Calendar. However, in light of the recent typhoon in the Philippines we thought that perhaps it would be better to show you all the ways that you can help in the aftermath of this disaster. You can of course classify on Cyclone Center to help researchers understand the science behind these phenomena, but we thought it would be good to point you at more direct ways to help those people affected by Typhoon Haiyan. Principally, you can donate directly to several aid agencies and their umbrella organisations. These include the UK Disasters Emergency Committee’s Haiyan appeal, USAID, Oxfam, and the Red Cross. To get even more involved there are things such as the Association of digital volunteering efforts for disaster response, the GeekList Typhoon Haiyan hackathon and activities on Open Street Map. If you have other ways to help that you think we should share, then get in touch via the comments or via our channels on Twitter, Facebook and Google Plus. Today we urge our Cyclone Center users to pause and send positive thoughts to our friends in the Philippines. Evacuations are underway as Super Typhoon Haiyan (known as Yolanda in the Philippines) makes its way directly towards the country. 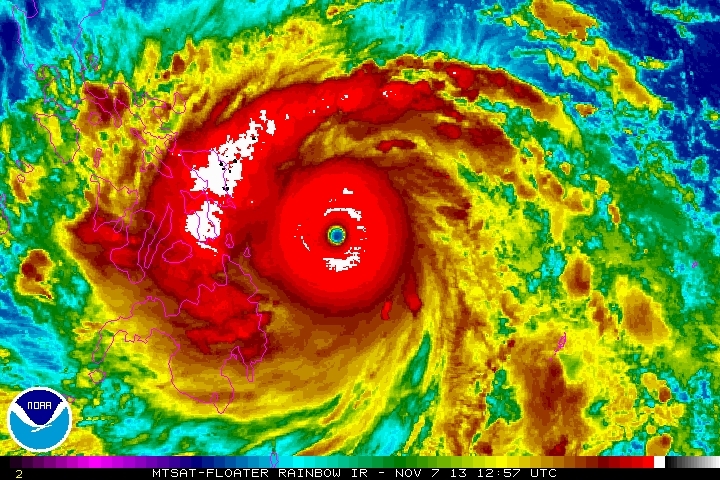 Intensifying without restraint since Sunday, Haiyan is now a Super typhoon, which is equivalent to a Category 5 hurricane on the Saffir-Simpson Scale. 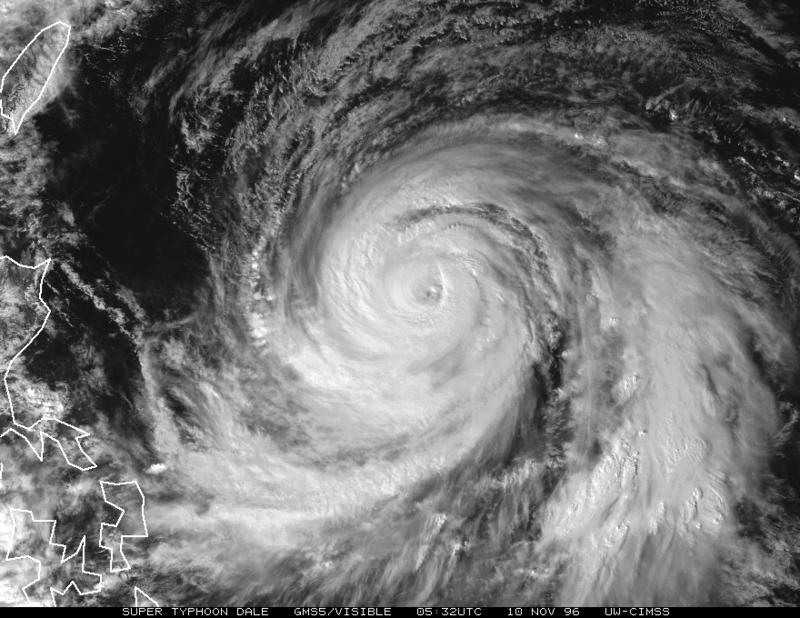 Haiyan currently has winds near 170 kt (195 mph). Moving west northwestward, Haiyan is expected to make landfall in the Philippines early Friday morning. Because of the very warm water temperatures along her path, Haiyan is expected to maintain her status as a super typhoon through landfall. With this super typhoon comes potentially severe damage. Haiyan is likely to bring heavy rainfall, severe flooding, damaging strong winds, and mudslides into very heavily populated areas of the Philippines. The forecasters at the Joint Typhoon Warning Center are encouraging evacuations across the country, especially in the central Philippines, in preparation for the biggest storm of the 2013 season thus far. She is the fifth super typhoon to form this year in the western Pacific. 1. Targeted storm choices. Choose your favorite storm to classify from a list of four storms that we’d like you to focus on. These storms will change frequently as you help us complete each one. Featured in the early sets of storms will be at least one storm from the historic 2005 Atlantic hurricane season, including Hurricanes Katrina and Wilma. Or, if you’re feeling adventurous, click the “Classify a random storm” button and get a mystery storm! 2. Inline classification guidance. Gone are the days of clicking on question marks to get help. For each step in the process, you will be shown information on how to best answer the question. Even though you have been doing great, we think this will give you more confidence in what you are doing and hopefully inspire you to do more! 3. Improved tutorial. Haven’t classified in a few weeks? Now you can access our improved tutorial at any time for a refresher. 4. More questions to answer. For each storm, go beyond the “choose the closest picture” to answer a couple of more questions like where the center of the storm is or how cold the clouds are around the eye. This used to be called “Detailed Classification”; your responses help us to better pinpoint how strong the storms are. 5. Real time feedback on your classification. Now instead of waiting for 6 images to see the “Storm Stats” page, you will immediately go there after your first image. 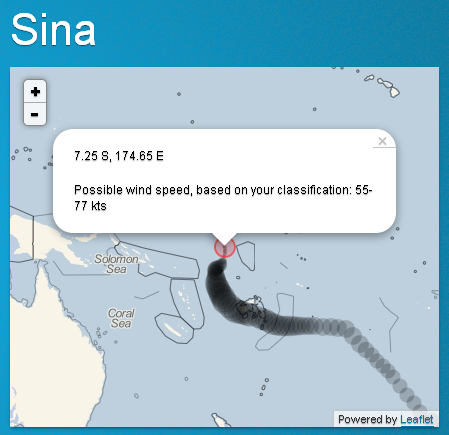 Now available on this much improved page is the storm track, the location of the storm you just classified, and our estimate of the wind speed of the storm based on your answers. 6. Upgraded Talk forum. “Talk” is how you can discuss interesting storms with others or us. The upgraded version allows for better searching and highlights more of the interesting discussions going on between other citizen scientists. 7. Better connections to social media. Direct links to Facebook and Twitter are now available on every storm on the home page. Click and discuss storms with your social communities or invite others to participate! Log in to Cyclone Center today and give the new version a try – we think you’ll like the changes. As always, please let us know what you think by commenting on this blog entry or through Talk! Seasonal Tropical Cyclone Forecasts Are Coming In – But Are They Worth It? Citizen scientists working on Cyclone Center are working with a few thousand tropical cyclones which have developed since 1978. Beginning just a few years later, Dr. Bill Gray at Colorado State University (CSU) first began issuing forecasts for the number of tropical cyclones that will develop in the Atlantic Ocean for the upcoming Atlantic season (June 1 – November 30 each year). Since that time, several other groups, including the U.S. National Oceanic and Atmospheric Administration (NOAA), have also developed similar techniques to predict seasonal activity. With the official start of the Atlantic season just a couple of weeks away, this year’s predictions are in. 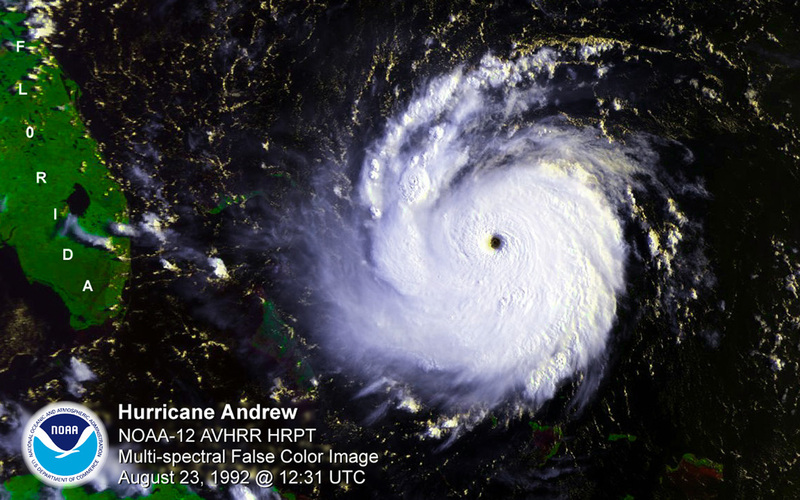 Hurricane Andrew, a devastating Category-5 storm, occurred during an extremely quiet Atlantic hurricane season. The CSU forecast, issued in April of this year, predicts 18 named storms (those achieving at least Tropical Storm strength), 9 hurricanes, and 4 major hurricanes (Saffir-Simpson Category 3 or higher). This is well above the long-term average for the Atlantic. The NOAA forecast, which relies on similar parameters to predict activity (e.g. warm ocean temperatures, El Nino phase), puts the chances of an active season at 70%. Groups in other parts of the world also produce seasonal forecasts for their own region. For example, the Bureau of Meteorology in Australia issues a national as well as regional seasonal outlooks. Recently, other groups such as the United Kingdom Met Office have begun issuing “dynamical” forecasts, which explicitly count tropical cyclone-like features in weather models rather than relating environmental conditions to past activity. Seasonal forecasts receive quite a bit of publicity, despite questions about their skill and usefulness. Statistical schemes such as the CSU forecast, rely on past connections between environmental factors and TC activity. They fail especially in predicting extreme seasons, such as the 1995 or 2005 Atlantic seasons, because the models just don’t know about hyperactive years like that. Dynamical predictions, which theoretically can predict record breaking years since they do not rely on past seasons, have been shown to have better predictive skill than statistical techniques for seasonal TC prediction. But even if a model were 100% accurate, would it really make a difference? 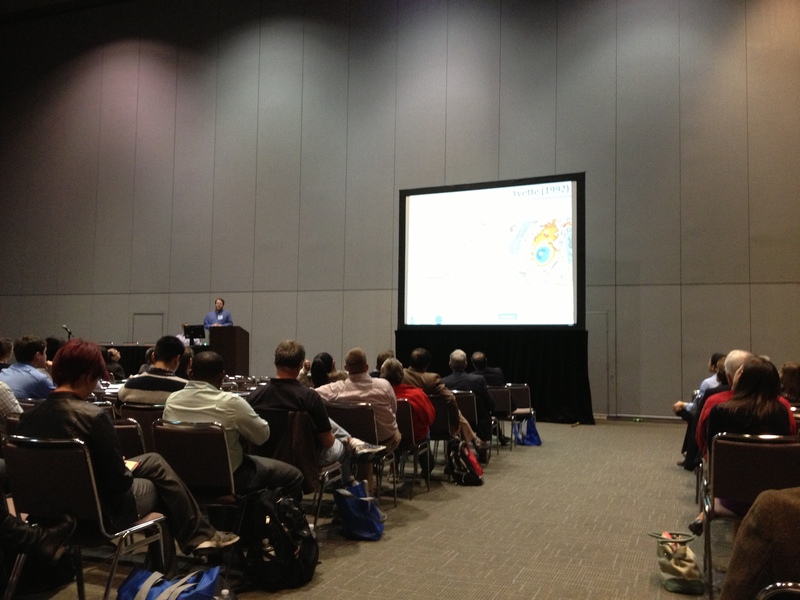 The majority of systems that do develop into tropical cyclones do not affect land. Predictions of landfall are made by several groups but have not shown any skill so far. For any given location of coastline, the chances of a TC impact in any given year are very small. So if a homeowner hears that the upcoming season will be active, should any action be taken? Does it really matter if we’re going to get 12 storms this year or 11? Remember that some of the most devastating hurricane events in U.S. history, such as Andrew in 1992,, occurred during inactive seasons. In the end, how do seasonal forecasts help society? One could argue that any publicity that gets people to assess their readiness is good – but I think that most will not do anything. Perhaps more effort should be invested in determining how the nature of tropical cyclones will change in our warming world. Cyclone Center is going to provide researchers with new data that will help determine if and by how much the nature of global tropical cyclone activity has been recently changing. With stronger tropical cyclones predicted in the Atlantic and other parts of the world – along with rising sea levels – time and energy is better spent developing plans for mitigation for the big ones rather than issuing forecasts with little or no value for coastal residents.